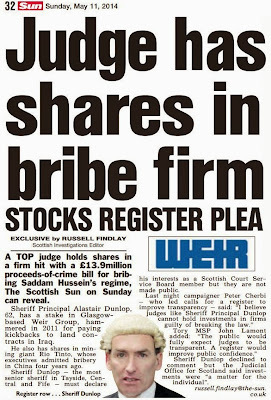 Scots Law should serve the public interest, not the legal profession's need for profit. 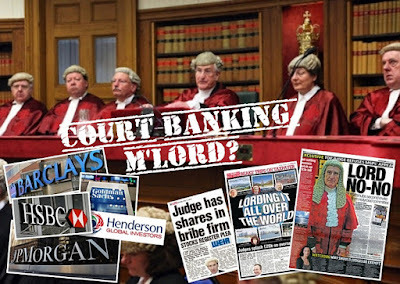 Members of the legal profession constantly talk about remaining 'independent' from Government, public scrutiny, and even independent from the law itself - although they use it as a business model for making themselves into an industry which ranks as one of Scotland's greatest money making enterprises .. or money making rackets, depending on your point of view. Many members of the legal profession who have been caught up in complaints over the years, on serious matters such as fraud, embezzlement, etc .. hardly seem to think the law applies to them - and for the main they would be correct. 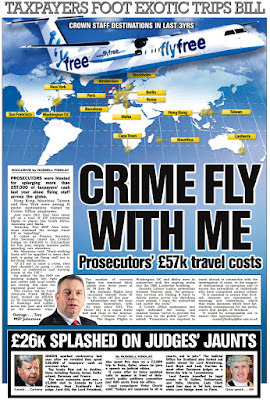 Just take a look at how many fraudsters & crooks are sent to jail who aren't members of the legal profession, set against those who are lawyers ... you will soon see a difference in the statistics, and come to the conclusion as many have, that lawyers can just about get away with blue murder. 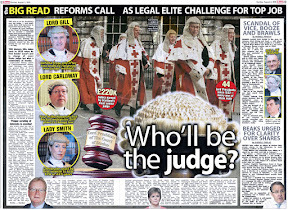 In any case, this week has so far seen lawyers congratulating themselves in the usual way of defeating the efforts of reform, stirring up a fight between Scotland & Westminster via some sections of the media on legislation long since agreed between our two countries ... and lawyers talking about how the law must serve society. If the law ever does serve society, instead of society having to serve it, I will have something much more positive to write about. In a Scotsman article on how the law must serve the public, I noticed a particular reference to Freedom Of Information, and how it makes a 'valuable contribution" to public authorities being regulated in their conduct of public affairs. "The objective of an efficient public law is that public authorities should be regulated in their conduct of public affairs. Freedom of information makes a valuable contribution to the attainment of this objective because unless there is openness in decision-making it is all but impossible to scrutinise whether any public body has proper reasons for the decisions taken. Freedom of information gives the public access to background papers shedding light on the factors that have in fact been taken into account and the weight attached to them, facilitating challenge to unlawful, arbitrary decisions." Well I would agree that at least, these were the intentions of FOI legislation, but as we see across many cases of disclosure, and refusal of disclosure ... FOI does not always live up to the mark, and it certainly does nothing for the legal profession itself, because the Law Society of Scotland saw to it they have an exemption from FOI - so, FOI seems of little use against lawyers, or anything to do with the legal profession which could cause significant change. 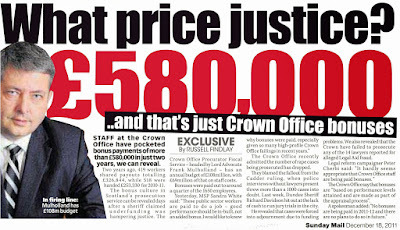 Earlier this week for instance, I was told by a source that yet again, the Scottish Government has been prevaricating FOI requests on information relating to disclosures sought on the relationship between Marsh UK, the Royal & Sun Alliance PLC insurers, and elements of the Courts Service and other parts of the Scottish Government, on the grounds of costs of disclosing the information. I found that slightly strange, given John Swinney's revelations of serious corruption at both the Law Society of Scotland and Marsh UK - who are financially involved with many departments of the Scottish Government, and including the GLSS - the Government Legal Services for Scotland, who themselves will I assume, be advising against disclosure for fear of the conflicts of interest and cosy financial relationships which should be revealed to the public. SCOTLAND has a vibrant public law, which is undergoing rapid change through a number of influences unique to our country – change to which practitioners can contribute if they recognise the full scope for innovation that these influences present. The first stimulus was the introduction of the procedure of Judicial Review, but that was a case of the tail wagging the dog – a change in procedure influencing the development of substantive law. 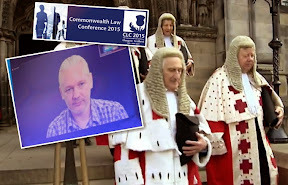 Nonetheless, it has opened the courts to participation in the principled development of public law that arrived with the New Labour agenda of constitutional reform in the shape of the Scotland Act 1998, the Human Rights Act 1998 and the Freedom of Information (Scotland) Act 2002. Their interaction has given potential for a peculiarly Scots dimension to public law. The essence of the constitutional change effected by the Scotland Act is that it brings more of a legal content to the control of legislative and executive power in Scotland. Subject to the exception of EU Law, English law remains grounded in the principle of parliamentary (that is, Westminster) sovereignty. Scotland is different because the Scottish Parliament is not sovereign and it is expressly provided by the Scotland Act that an Act of the Scottish Parliament "is not law so far as any provision of the Act is outside the legislative competence of the parliament", which embraces any incompatibility with the European Convention on Human Rights (ECHR). Courts can accordingly go beyond the political act of issuing an advisory opinion that legislation is incompatible with the convention (which is all that English courts can do relative to Westminster legislation), right up to the ultimate legal remedy of quashing legislation enacted by the Scottish Parliament. In Scotland, this fundamental shift from the supremacy of legislation goes further and affects even the implementation of Westminster legislation. The Scottish Government does not have the power to infringe human rights, irrespective of whether the infringement is based on Holyrood or Westminster legislation. These arrangements are not, however, undemocratic, because the rule of law does not mean rule by lawyers. In the litigation concerning the validity of the ban on fox-hunting, the courts did not ask whether the ban was a good or a bad idea. Rather, the courts scrutinised whether, in enacting the ban, the Scottish Parliament took proper account of the human rights involved and struck a fair balance between the rights of the individuals who participate in hunting and the interests of the community. To date the ban has been upheld by the courts on the view that a fair balance was struck by the democratically elected legislature whose task it is to resolve controversial questions. The need for a fair balance between the rights of the individual and the needs of the community runs through the ECHR and now lies at the heart of Scots public law. There has been a suspicion in some quarters that Scottish judges went too far in deciding that a person charged with a criminal offence should be automatically acquitted in the event of an unreasonable delay in being brought to trial. That result seemed to give undue precedence to the rights of accused persons over the rights of victims of crime and the general public, who under the convention are entitled to the protection of an effective criminal justice system. That imbalance has now been corrected by the Privy Council, which recently decided that an unreasonable delay does not necessarily require an acquittal. The objective of an efficient public law is that public authorities should be regulated in their conduct of public affairs. Freedom of information makes a valuable contribution to the attainment of this objective because unless there is openness in decision-making it is all but impossible to scrutinise whether any public body has proper reasons for the decisions taken. Freedom of information gives the public access to background papers shedding light on the factors that have in fact been taken into account and the weight attached to them, facilitating challenge to unlawful, arbitrary decisions. We are at the start of a dynamic process that could lead to a distinctive public law built on a fusion of the new constitutional arrangements for Scotland, human rights and freedom of information. The task we have is to formulate a constructive public law that is responsive to the key objective of producing a tolerant and broad-minded society which is respectful of the rights of the individual while attending to the needs of society as a whole. 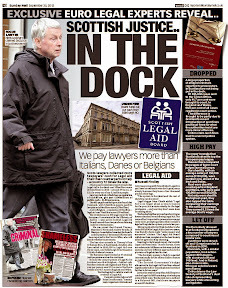 • Gerry Moynihan QC is a member of Axiom Advocates. He gave last week's Third Thursday Lecture on public law. Anyway, while some in the legal profession lecture us on the law having to serve the public, others in the legal profession seek to deny the public even an input into long needed reforms to the legal services market, preferring to spout forth the Law Society's policy of censorship and targeting campaigners & critics, rather than engaging the public and resolving their sins of the past, known to be many. The article ends with a vitriolic attack on critics of the legal profession and campaigners for change, proving perhaps that a little falling ice provides no seeing of the light .. and preferring to reinforce the Law Society's mantra of 'lets silence anyone who could be a threat or have input into reforms against lawyers interests'. IDLING on The Scotsman website, I found some feedback on my last piece. I'm so flattered. It's all hate mail. One correspondent, however, inadvertently gave me a good bit of advice, namely to read Jess Brallier's (now out-of-print) book, Lawyers and Other Reptiles. It's wonderful. I have always loved lawyer jokes and quotes, and this book is full of them. All I can say is the title is a bit hard on reptiles. What have they done to be cast as bedfellows with the lowest form of living scum? My favourite quote so far is from the New Yorker: "I told you that you should've got yourself some legal advice before running to a lawyer." It hints at several of the reasons why such expressed vitriol against our noble profession so proliferates. The first reason is money. Lawyers are expensive. If you "run" to a lawyer, the chances are you'll get a bill, and a hefty one at that. No-one likes bills, and an easy way to externalise this dislike is to blame the biller rather than the billed. In the excitement of their initial consultation, I find it hard to get clients to face the financial reality of their principled crusade, or their precarious venture. I have to tell them that the practice of the law, and the results obtainable, are not necessarily the same as the client's perception of justice. Yes you should think twice before going to a lawyer. The fact that the money you pay him or her is substantially to cover the overhead he or she has to maintain in order to give you the service you seek is not an easy swallow. After all, you've seen his/her Merc. But the quote is tellingly ironic as well. How can you get legal advice on whether to get legal advice? The fact is you can't really. Lawyers are no doubt expensive, time-consuming, anxiety-broking vultures (now we're insulting scavenging birds), but they are necessary. You can't avoid them. One of the ironic outcomes of the political drive to treat lawyers like bad children is the enormous length of the engagement letter that solicitors are now required to issue before any work is done. My tongue is not entirely in my cheek when I say that clients should perhaps get a different lawyer to check over the intended lawyer's terms and conditions. But who checks the terms and conditions of the checker? I think the main reason for books such as Brallier's is this: lawyers don't deserve it, and the lawyer-bashers know this full well. The jokes are only funny because they are jokes. They express the angers and frustrations of litigants and clients precisely because their lawyers have not caused the problems, but rather have earned a living out of them. I can understand the epithet "parasite" but it can be used, with greater or lesser justification, upon all sectors of service industry. 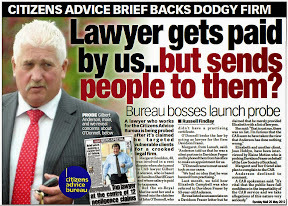 Yes, there are some very serious cases of bent, greedy and self-serving lawyers. But if these were the norm, rather than demonstrably the tiny minority, the whole joke culture would collapse. After all, no-one makes jokes or collects pithy sayings about perverts or genocidal maniacs, bankers or any other persons held to be truly reprehensible. Do they? These critics will say that they are the victims of bad lawyers whose actions have damaged or ruined them beyond any joking. Perhaps they are right; certainly they are humourless; but they are a minority. They allege corruption at the very core of the profession and its governing body, which is surely beyond credibility. Is it right to allow them such influence in current demands for reform? There may be a few rotten apples. But the tree is still healthy. 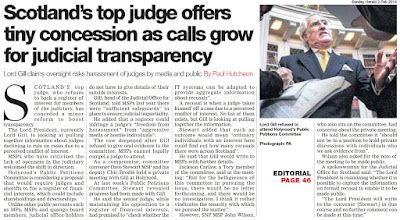 Calls seem to be growing for full disclosure of the backgrounds, previous work and investigations into certain appointees to the new Scottish Legal Complaints Commission, after my breaking the story earlier this week that the same Law Society of Scotland staff who have betrayed so many members of the public in complaints against rouge & crooked lawyers are to be migrated to the new 'independent' complaints body. The Justice Directorate, in days reminding us of earlier times when Government was continually accused of stage managing appointments, covering up scandals, backgrounds and conflicts of interest so those with political affiliations could find their way to quango heaven, has embarked on the same path of cover up, in an attempt to thwart any proper investigation into the murky appointments scandal of members to the Scottish Legal Complaints Commission. 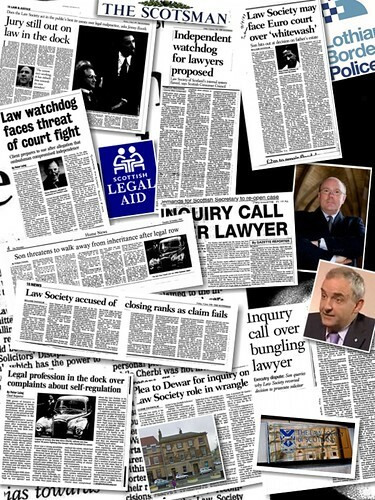 In a letter released today, the Justice Directorate fails to apply any transparency or accountability to the continuing furore over the appointment of lawyers and ex Police Chiefs to the new 'independent' SLCC, choosing only to continue the cover up over what many are viewing as a fairly successful attempt by the Law Society of Scotland to take over the Scottish Legal Complaints Commission for its own purposes - that of continuing to protect lawyers from any possibility of independent regulation and a fair hearing for public complaints. Justice Directorate - Lawyer who was panel solicitor for corrupt insurance scheme and ex cop who was lay member of Law Society committees have no conflict of interest. What ? 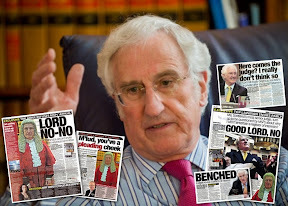 You ask whether Mr [David] Smith's current firm, Shepherd and Wedderburn, are panel solicitors for Royal Sun Alliance as you consider this to be a conflict of interest. As you may be aware from their website Shepherd and Wedderburn are indeed panel solicitors. As with all holders of public office the Commissioners are required to act solely in terms of the public interest and display integrity, objectivity and honesty. I do not therefore anticipate any conflict of interest. Furthermore I understand that Mr Smith will be retiring from Shepherd and Wedderburn on 1 April. You also express concern about the appointment of Douglas Watson. 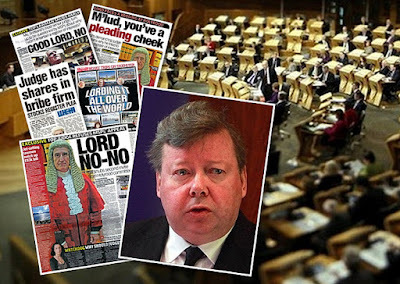 Mr Watson no longer sits as a lay member on the Law Society of Scotland's committees." 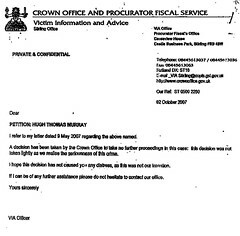 The Justice Directorate's reply admits Mr Smith's involvement with the Royal Sun Alliance after earlier revelations in this blog that David Smith is a panel solicitor for the Royal Sun Alliance, who are main insurers to the infamously corrupt Master Insurance Policy scheme operated by Marsh UK and the Law Society of Scotland to protect lawyers from negligence claims. 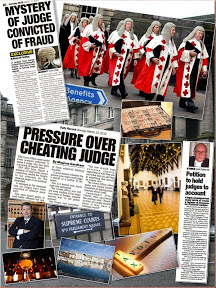 During the Parliamentary hearings on the Legal Profession & Legal Aid (Scotland) Act 2007, which created the 'independent' complaints body which Mr Smith, a lawyer, has been appointed to, the now Cabinet Secretary for Finance, John Swinney, revealed evidence that systemic and endemic corruption existed in all aspects of the Master Insurance Policy, culminating in a very public confrontation with Law Society Chief Douglas Mill, who lied in evidence to the Justice 2 Committee and to Mr Swinney the Law Society did not interfere in negligence claims - when in fact the secret memos revealed by John Swinney showed a culture of intervention and interference to protect crooked lawyers and ensure their continued practicing while clients got nothing. Law Society boss Mill lied to Swinney, Parliament as secret memos reveal policy of intervention & obstruction on claims, complaints. 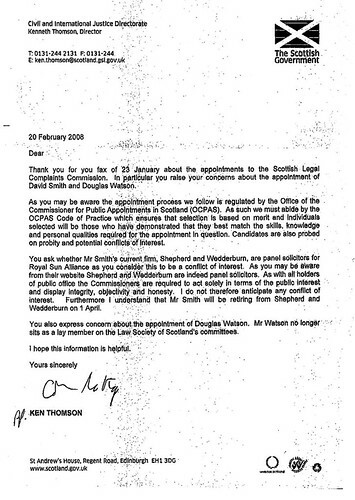 The Justice Directorate, despite the fact of revelations that SLCC appointee Mr Smith is a member of the legal teams which support the Master Insurance Policy which Cabinet Finance Chief John Swinney exposed as being totally corrupt, claim in their letter that " As with all holders of public office the Commissioners are required to act solely in terms of the public interest and display integrity, objectivity and honesty. I do not therefore anticipate any conflict of interest." A lawyer who spends a career being part of the Master Policy Insurance team which Law Society Chief Douglas Mill's memos reveal is totally corrupt, can change his ways and act solely in the public interest ? Is it possible ? I don't think so. Not after having learned first hand of what happens to clients at the hands of the lawyers who represent the Master Insurance Policy and the insurers ... everything from your health records, bank records, title deeds, employment, the lot, all used to effectively wipe out someone who dares make a claim to the Master Insurance Policy against a negligent lawyer. 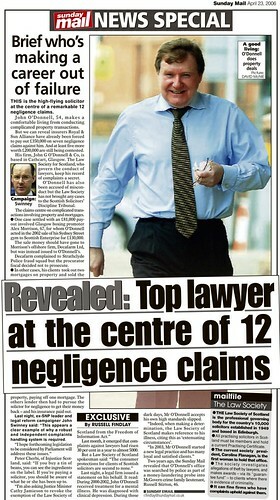 There must now be a full investigation of Mr Smith's work as a solicitor involved with the Master Policy insurers, which legal firms he and his own firm defended against negligence claims, what happened to those cases & claims, and the client's access to justice and full public disclosure of all the facts to see that old habits and conflicts of interest wont be transferred to the new 'independent' SLCC - disclosure which must be in the public interest. Douglas Watson also gets the same whitewashing treatment from the blundering Justice Directorate in today's release with the following; "You also express concern about the appointment of Douglas Watson. 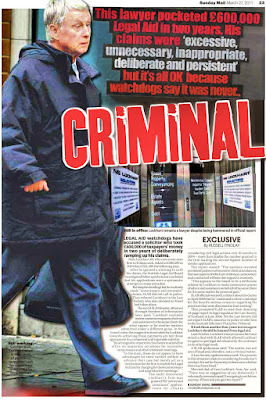 Mr Watson no longer sits as a lay member on the Law Society of Scotland's committees." Simply because Mr Watson "no longer sits as a lay member on the Law Society of Scotland's committees" is not a good enough reason prevent any investigation of his appointment. When did Mr Watson resign anyway ? This seems to be new information. Did it come as a result of him recognising there may be a conflict of interest or was it because of public exposure of his previous position ? Indeed, the fact remains that both Douglas Watson and David Smith will inevitably face issues involving legal firms and lawyers who have been before the Law Society committees during their respective terms in Mr Watson's case as a 'lay member' of a complaints committee and in Mr Smith's case as a panel solicitor for the insidious Master Insurance Policy. 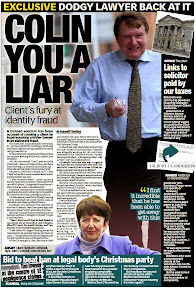 What particular aspect of being a lay member of a Law Society complaints committee qualifies Mr Watson to be migrated into what was supposed to be the new 'independent' complaints body to resolve the problematic, corrupt self regulation of the legal profession carried out by the Law Society of Scotland. Along with the 34 members of staff who have helped countless crooked lawyers escape any punishment over serious client complaints such as embezzlement, theft of property, theft of deceased client's wills and even re-writing them, negligence to the nth degree, altering case evidence and faking up clients files, falsifying clients accounts and accounts for work, to name but a few of the habits of the legal profession, what qualifies ex Law Society committee members for transfer to a body created to be a 'break from the past' ? 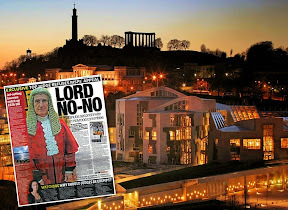 There should now also be a full disclosure and investigation of all Mr Watson's work as a lay member of the Law Society complaints committees, and also full disclosure of all the internal investigations by Lothian & Borders Police into Mr Watson's conduct, in investigations reported in the media, which seem also to have escaped the appointments process. A POLICE chief has been accused of jeopardising a £1 million-plus project by having an affair with a female officer he promoted. Chief Superintendent Douglas Watson is facing an internal inquiry after he walked out on his wife to be with an officer he hand-picked for a specialist squad. Allison Strachan was personally selected by Watson to be part of a 22-strong team which is carrying out a complete review of the way Lothian and Borders force operates. Strachan, who had twice failed to win promotion, was plucked from an administration job at police headquarters and promoted to Inspector but senior officers are angry after it was revealed Watson has been having an affair with her. The affair has been the talk of the force since Watson left his second wife Anne and Strachan left her police constable partner, John Donoghue. Watson, the former head of CID, was picked by Chief Constable Paddy Tomkins to head up the Capital Project, which will completely change the way Edinburgh is policed and create a single 1,000-officer super-division. The cost of the project is put at over £1 million, including wages, computers, travel and cars and Watson was expected to be appointed commander of the new division but senior sources say an inquiry into his behaviour is now inevitable. Chief Supt Watson left his first wife 11 years ago when he began an affair with his current wife Anne, who was then a 19-year-old secretary at police headquarters. 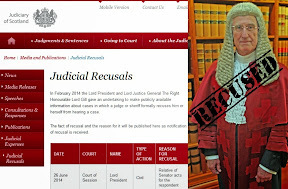 Anyway, this is an interesting turn of events, as earlier this week, the Justice Directorate had continued to refuse any explanations over the SLCC appointments scandal, insisting somewhat unbelievably, that ex police and lawyers constituted an 'impartial' appointments process to a body which was to consider complaints against lawyers. Just how bad things are with the Government's blunders surrounding the SLCC was indicated to me this morning when a source connected with events commented that no one could really trust the disciplinary records of any of these people, even those appointed to the Commission themselves, as they were the work of the Law Society staff who are well known to falsify complaints files and disciplinary issues to protect lawyers. 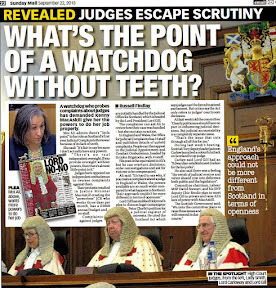 My source then went on to comment that details on appointments he had seen "could not be independently verified in any way whatsoever as the Government were having to solely rely on the Law Society to provide these papers due to the old system of self regulation of the legal profession, the lack of accountability to FOI and very poor oversight powers of the Scottish Legal Services Ombudsman"
So, the new Scottish Legal Complaints Commission will be anything but independent. It will be staffed mostly by Law Society staff who have had orders for the past twenty years to get lawyers off the hook at any costs, and the Commission itself is full of lawyer and ex Police appointees, some of whom even sat on Law Society committees themselves. This sounds like a bad deal for Scots, a bad deal for justice, a bad deal for independence, accountability, transparency and honest, all being presided over by bad management of the Justice Secretary Mr MacAskill who is of course a lawyer and has indicated many times he favours the legal profession's priorities over that of the public interest. Justice Secretary Kenny MacAskill continues to disappoint the public in terms of their consumer rights against lawyers & legal services as it was revealed today that telephone comments by staff at the the Scottish Government's Justice Directorate have revealed that a vast amount of staff from the Law Society of Scotland itself are to be migrated to the new 'independent' Scottish Legal Complaints Commission, where 'independent' means ... 'more lawyers than ever'. 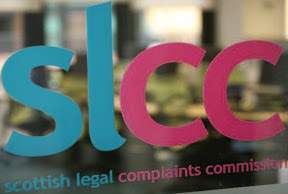 At least 34 members of staff from the Law Society's headquarters at Drumsheugh Gardens in Edinburgh, are to work for the new SLCC, which was confirmed in a telephone conversation upon enquiries over the make up of the 'independent' complaints body. 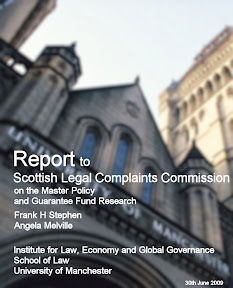 The SLCC, which is yet to even start its work, but has suffered from constant attempts at the hands of the Law Society of Scotland to undermine its function, is rapidly losing it's independence from the legal profession at the hands of Justice Secretary Kenny MacAskill, even though the aims of the new complaints body was to be a break from the past and ensure independent regulation of complaints against Scottish solicitors. We were to be treated to a spin release from the Justice Directorate over the influx of Law Society personnel as a way of 'bringing into the SLCC the most capable staff of dealing with complaints against lawyers' but discussions on how to go about this still seem to be ongoing, as some are concerned over the 'more jobs for the lawyers to protect each other' image it brings to the SLCC. 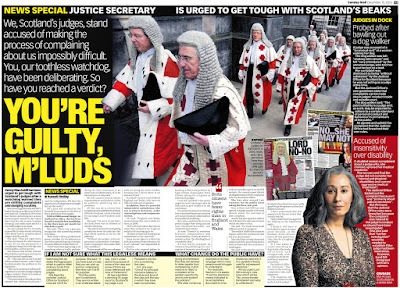 A source at the Justice Department speculated that many of the members of staff from the Law Society had themselves been involved in mishandled complaints against some very well known solicitors, where clients rights and finances had been seriously breached by the conduct of their legal representatives, with the Law Society of Scotland taking a back seat and ultimately letting those solicitors, some who had been involved in serious financial frauds against clients, to escape penalty, while ensuring the client got no compensation. As one lawyer put it this afternoon after hearing the Law Society staff were being squirreled into the new regulatory body - "that's like asking serial abusers to go into their victims homes when they are alone and abuse them again. I don't think the public will be very happy at that." So, TUPE saves the day for the same people who are responsible for getting as many crooked lawyers off the hook as possible ... for instance, the people who let John O' Donnell amass some 21 plus negligence claims, will be saved by TUPE and instead of getting paid by lawyers to knock off complaints against lawyers, they will be getting paid by the taxpayer to knock off complaints against lawyers ...good work if you can get it - but not one move to tackle the long line of victims left by their prejudiced anti-public work at the Law Society of Scotland. The conveniently placed review of the Law Society's workings, which have been geared for the last few decades to getting as many lawyers off the hook from public & client complaints, might see jobs protected but will deliver a final blow of dishonesty to what was to be a new hope for independent complaints handling against the legal profession. "We have already announced the establishment, location and membership of the Commission.There are no plans for any further announcements at present"
The continuing demise of the Scottish Legal Complaints Commission even before it begins its work, seems to be aimed at preventing clients of solicitors and the public getting a fair hearing of their complaints in the independent venue which the SLCC was designed to be. 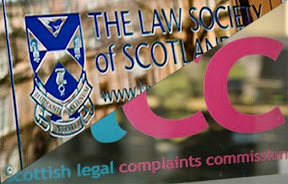 Allegations of continuing interference in the SLCC's formation process by the Law Society of Scotland, and charges of an almost "clueless attitude" at the Scottish Government on how to go about forming the new independent body to deal with public complaints against lawyers, have helped the legal establishment see that everything down to even the SLCC's appointments process has seen many from the legal profession itself migrate into the new body designed to prevent the mistakes of the old. 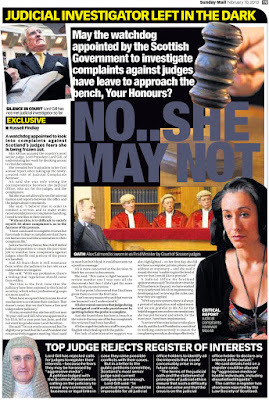 It's almost like the Law Society of Scotland has now renamed itself the "New" Law Society of Scotland - in the form of the Scottish Legal Complaints Commission, and is ensuring professional survival and control over regulation by getting their own staff into the new complaints body to prevent fair & proper hearings of public complaints against crooked lawyers. Also today, the Scottish Government refused requests from myself and others to carry out an investigation into the appointments process, citing there was no such need and that everything had been handled correctly and above board with all appointees declaring their full histories and backgrounds. 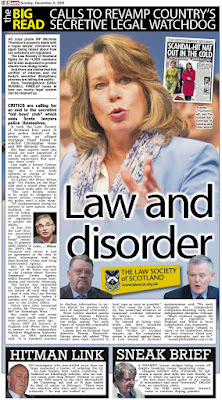 However as you know this is not the case at all, and the new Chairman Jane Irvine, confirmed in writing she had not been given any prior knowledge of the appointees to the SLCC, even though they include lawyers whom her office has considered complaints against how the Law Society of Scotland has handled complaints against their respective legal firms and other solicitor partners, and the checkered histories of ex-Police appointees to the SLCC to which the incoming Chairman was also not made aware of. A Justice Department civil servant today stated that "shortlisted lawyer candidates were subject to checks on their disciplinary record" but those records were themselves provided by the Law Society of Scotland - who are well known to fiddle a few complaints against crooked lawyers and legal firms ... so the records themselves have no validity whatsoever other than perhaps whitewash value, which the Justice Secretary seems to be using quite well .. when it comes to his friends in the legal profession. As for the public, well, there is clearly a diminishing chance of getting your complaints heard properly at the hands of the new Scottish Legal Complaints Commission, when it is going to be comprised of mostly migrated staff from the Law Society of Scotland. The Law Society of Scotland have wasted no time in getting their spies into the new SLCC, and I say that with considerable ease, as given the performances I have seen from the Law Society staff against poor clients who had to complain against a crooked lawyer, I wouldn't trust anyone who worked at the Law Society to be able to change their conditioning and work in what is supposed to be a completely transparent regulatory environment at the SLCC, compared with the secretive, closed and corrupt regulatory environment at the Law Society of Scotland. Not much of a public interest performance from Kenny MacAskill then, who doesn't seem to value Scots rights at all when it comes to dealings with lawyers. 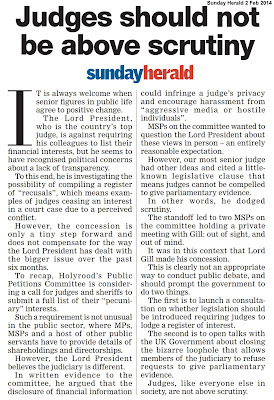 There does seem to be a problem emerging now with the SNP on issues of Justice and public access to it. 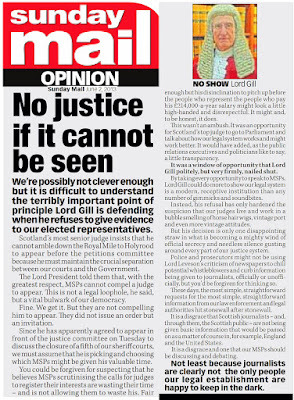 While I am fully supportive of many other Scottish Government policies in different walks of life, I am left to wonder, as many now are, why the SNP is failing on justice. Is that solely down to Kenny MacAskill and if so why is this being allowed to happen ? One could be forgiven for thinking that lawyers hate the public after recent vitriolic attacks on the public's right to access to justice from certain quarters of the legal profession, but many have known for some time there is no love lost between solicitors & their clients these days. In what may be a defining point in the debate on how the public should be able to freely choose their legal representatives without that being decided by the legal profession itself, Solicitor Advocate Frank Maguire, of Thompsons Solicitors Glasgow, vehemently rejects the idea that consumer law should be applied to clients dealing with solicitors, fearing of course, the ramifications of the impact of consumer law on the legal services market, which would inevitably drive the huge & restrictive costs of legal services down to more sensible and competitive levels which everyone could afford. Mr Maguire launches a scathing attack on what the public perceive as their right to access to justice, and access to a decent standard of legal service which has never been given by the legal profession under the administration of the Law Society of Scotland, to date. "I find the "consumer rules" philosophy naive. The irony is that these very consumers will come to lawyers whom they will want to be independent of such commercial undertakings. The consumer lobby has had too much influence so far in our Scottish society. It now needs to be checked and, instead, we should be reasserting a rights-based system underpinned by an independent judiciary and an independent legal profession." Good for you Frank. In the light of your obvious disdain for the public interest, can you tell us when are the swastikas being hoisted in front of the Law Society's Drumsheugh Gardens office ? It sounds like you want to check democracy itself, swapping Parliament for the rule of the unaccountable judiciary and the legal profession. I don't think that's in the public interest at all ... and as far as consumer rules philosophy being naive, well, at the end of the day its the consumers money which is keeping you in work. Don't like it ? Go and be a plumber instead and don't fit any bent pipes. For me, I prefer electing a Parliament to consider and legislate rights for the public, rather than handing over the process to the professions and vested interests who are only concerned with fattening their balance sheets and purchasing a few extra houses & cars for themselves at the cost of everyone else. Lawyers seem to have forgot who they are at the end of the day. They are a business, they use the law as a business model for making money out of us, out of corporations, out of Government, and out of just about anyone they can take money from. Lawyers serve the law and make money from it.They are not 'above the law' nor do they 'reign over us' as they like to think they do. We are their masters.It is our money which keeps them in fancy houses, fancy cars, bonuses and that big bit on the side. It's time to apply new rules and new laws to the relationship between the public and the legal profession, as clearly, the public need to be boss for a change, not being bossed around by the legal profession or arbitrarily denied access to justice on the whim of a lawyer. I note Mr Maguire cites among his examples, the victims of accidents, disasters & the tainted blood products scandals that these people are "consuming nothing" when it comes to Justice. "Try telling families of the Stockline factory explosion, the recent tugboat tragedy on the Clyde, the husband of the family wiped out in a car accident from diesel spillage or someone dying from an industrial disease or infected with blood products, that they are consuming justice. They are consuming nothing. Their right to justice is the same as their right to education and health, and it is the duty of society to uphold that right." Oh yes, all these tragedies, disasters, scandals, and all those victims waiting years, decades even for action while their lawyers sit back and take the money, with little or no return. How long do the victims of the contaminated blood products scandal have to wait until they get a proper inquiry, explanations and compensation for what happened to them ? What about those who are already dead ? Why have these poor people had to wait years, decades for action on this while lawyers have taken the money claiming there was action or success "just around the corner", and "just around the corner" never comes ? Do you keep telling a client of five years plus "Oh we are about to win; about to win, about to win, there is going to be an inquiry soon and you will get a lot of money, we will all win, the group will win .." and nothing happens ? How long can a victim take that kind of talk from a lawyer they are constantly paying to represent their legal interests and obtain them access to justice which society has failed to deliver ? In fifteen years time with the client nearly dead will you still be telling them "We are about to win, you will get your inquiry soon" ? Would applying consumer law to an opened legal services market, coupled with a strong, independent Legal Services Board style regulatory authority, allow consumers to wait ten, fifteen, twenty years for a legal service with an end result to be provided ? I don't think victims of tragedies, disasters, bombings and scandals would or should have to wait all those years and pay all that money to their legal representatives for nothing, so if consumer law were applied to legal services as it should have been a long time ago we wouldn't have all these decades old cases of injustice which the legal profession seem to be driving themselves just to fatten profits once again. It certainly is the duty of society to uphold a person's right to justice - but it is not the duty of the legal profession to decide who gets access to justice, the power which lawyers have lorded over the rest of us for far too long. The public consume justice, and have a right of access to it. 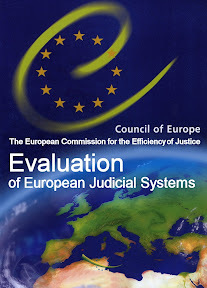 Consumer law, coupled with a strong independent regulatory authority which will also oversee the enforcement of standards of the legal services market must be applied to legal services to ensure public confidence, trust, transparency, accountability and provide a safety net in the event of any failure of those legal services. These benefits can only be achieved with opening up the legal services market which is truly in the public interest and ensuring the consumer is protected at all times, as we should be, because, its our money, its our right to justice and it's our right to ensure we get good legal services we can rely on, trust, and be assured that if things go wrong, we don't lose out and have a strong independent regulator safeguarding standards and ensuring proper compensation for failures of service. 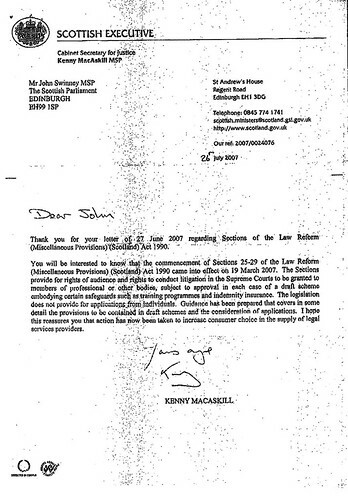 A further "supercomplaint" is warranted in this case, in the public interest, as it is clear from the steps the current Justice Secretary Kenny MacAskill has taken to align himself with the current leadership of the Scottish legal profession, that he prefers no change to any change, simply to protect lawyers profits over the rights of the public to gain a measurable access to justice not seen before in Scotland. The impotice for change therefore must come from consumer organisations, and again perhaps, the OFT, as too many lawyers still control the legal services debate currently raging in Scotland. I would therefore urge the Which? 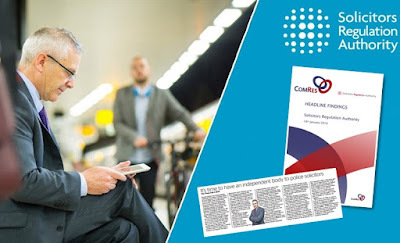 organisation, in the light of their stance on the issue of providing Scots with an opened legal services market to make a further challenge by way of a "supercomplaint" on the regulatory aspect of the current legal services market model in Scotland, which must see the implementation of a fully independent Legal Services Board just as the rest of the UK enjoys. Burning issue: Should consumer justice prevail in our legal system? I REJECT the fundamental principle underpinning this whole debate, namely the consumer lobby's assertion that justice is consumed. 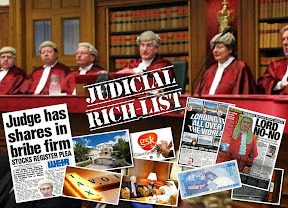 Try telling families of the Stockline factory explosion, the recent tugboat tragedy on the Clyde, the husband of the family wiped out in a car accident from diesel spillage or someone dying from an industrial disease or infected with blood products, that they are consuming justice. They are consuming nothing. Their right to justice is the same as their right to education and health, and it is the duty of society to uphold that right. Lawyers are portrayed as obstacles to civil justice, enjoying monopolistic control of the legal market, leading to high prices and commensurate profits. The monopoly, it is said, must be broken. Legal advice and representation should be open to non-solicitors. Solicitors' and advocates' practices should be open to ownership outwith the profession and even by such entities as banks, building societies and, no doubt, estate agents and claims companies. The promoters of such an agenda are those who profess to represent the consumer, like Which? ', the magazine. I find the "consumer rules" philosophy naive. The irony is that these very consumers will come to lawyers whom they will want to be independent of such commercial undertakings. The consumer lobby has had too much influence so far in our Scottish society. It now needs to be checked and, instead, we should be reasserting a rights-based system underpinned by an independent judiciary and an independent legal profession. WE ALL agree legal services are vitally important. Access to justice and an independent legal profession are cornerstones of our democracy. But there appears to be confusion among some in the legal profession about what we are campaigning for. We support the rights of people seeking justice from the courts. But we also want to see the market liberalisation of legal services such as will-making, conveyancing, divorce, employment rights; matters that many members of the public will find themselves addressing at some point. With competition, new providers will emerge, stimulating innovation and delivering high standards of customer service, greater efficiency and improving price and quality for consumers. As the Financial Times of 6 June, 2006 said: "Competition delivers results in ways that government bureaucrats cannot anticipate. Consumers can expect more choice, innovative services and lower prices. Familiar brands such as Tesco and the AA have nothing to gain from offering substandard legal services." By enabling competition and lower prices, liberalising the industry is likely to increase access to legal services for people who have been effectively priced out of the market by cuts in legal aid. Which? has considerable expertise in improving consumer markets for the good of everyone using these services. 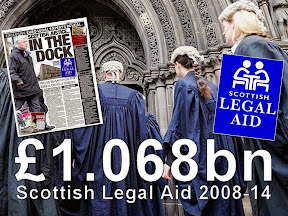 And Scottish legal services is a consumer market worth £1.2 billion. We would like to see regulation by a new Legal Services Board including in its objectives access to justice and the protection of consumers. What we have now is lawyers regulating themselves. Labels: access to legal services, Frank Maguire, Kenny Macaskill, Law Society of Scotland, OFT, Scottish Government, Which? 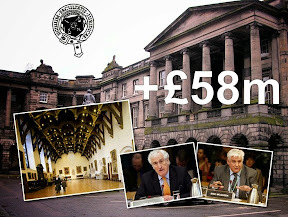 Law Society Chief Douglas Mill's latest creation of 'strategic change', along with costly posts funded [but not voted on] by the membership, has not lasted long in the pretence of bringing change to the Scots legal profession in the face of looming changes to the way the public can access the legal services market. As the new 'head' of 'strategic change' at the Law Society reveals in media articles today, the policy of the Law Society to maintain the closed shop of legal services, is to bring paralegals to the fore, ensuring they are fully 'Law Society registered' as the latest excuse to obstruct progress towards the opening of the legal services market to anyone suitably qualified and reaching suitable standards which the Law Society itself have never been able to attain or maintain. The Paralegals profession has existed for a long time - and enjoy almost the same high levels of complaints against poor service & conduct, as do solicitors. Since paralegals are for the most, unregulated, pursuing complaints against their work has been problematic at best. 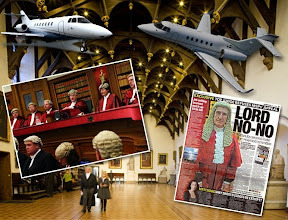 The Law Society, in their 'cunning plan' to maintain a closed shop of legal services, can see that paralegals themselves can be a key tool in the fight to maintain that monopoly of access to justice which the legal profession dominates .. so to this end, there is to be a scheme established to register paralegals .. and take them 'under the wing' of the Law Society itself. 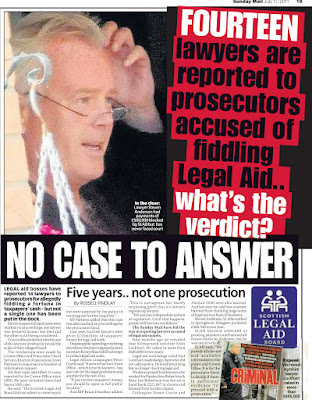 This move will certainly not give any client a better chance of having a fair hearing of a complaint against a paralegal's poor service, probably as complaints figures against solicitors over the years have demonstrated, it will make matters much worse and ensure the Law Society's habit of whitewashing the legal profession for even the most serious scandals will continue long into the future. So, what do we really need to bring change to the legal profession ? Well, for a start, we need a fully independent legal services regulator, much like the Legal Services Board in England & Wales - something which Justice Secretary Kenny MacAskill angrily denies Scotland needs - because he feels, as a lawyer himself, that the legal profession should be independent from the rest of us and be able to get away with what they please. Such an independent legal services regulator, free from any influence or ex staff & hangers on from the Law Society of Scotland and it's various affiliates, could get on with the task of ensuring standards within an opened legal services market, and tackle regulation & disciplinary matters of all kinds, leaving the Law Society as little more than a union for lawyers as it always should have been - not the sole regulator of the legal profession as it has proved it cannot be. Gone should be the days of £159+VAT for three lines of text on an A4 page ... and legal work which might cost £200 spun out to end up as something like £4000 .. if only the legal services market could be opened up, but as you can see, the legal profession don't want to lose their cash cow, and control over how you, the public, have access to legal services and the courts - and that control extends far up the political ladder, as recent actions from the Justice Secretary on these issues, which can only be viewed pro-lawyer and anti-public. 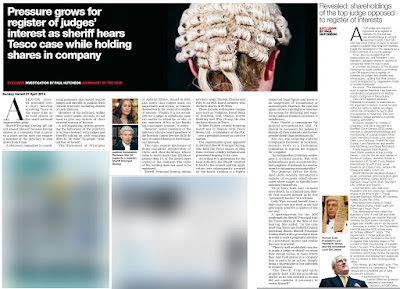 Of course, to get the legal services market fully opened up, we need to have someone other than the Justice Secretary and the Lord President clearing individuals or companies applications to enter the legal services market, as both the Lord President and the Justice Secretary Kenny MacAskill are members of the Law Society of Scotland. We all know the Law Society of Scotland wants to maintain the closed shop of legal services .. so it's no surprise that Mr MacAskill and the Lord President have been sitting down happily striking out all applications to enter the legal services market to-date. As readers will recall, Mr MacAskill mislead both the Cabinet Secretary for Finance John Swinney. 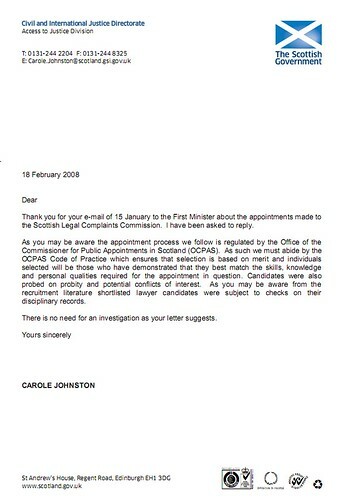 and the Parliament itself on this matter where he claimed in a leaked letter that people could indeed apply for rights of representation - but all have failed so far under the pen of Mr MacAskill and the Lord President. So in short, no change from the Law Society in it's 'strategic change' policy, but that is not unexpected because let's face it - who would want to lose control over the biggest money making monopoly in Scotland today - control over access to justice, access to legal services, and the right to charge and fleece the public for exorbitant costs of using those legal services. Something about a leopard never changing its spots ? CONFUSED? You are not alone… paralegals have long been a vital part of the legal market in Scotland. You’ll find them working with individual clients looking to buy a home or take a civil case, and you’ll find them working for Scotland’s largest commercial firms and financial institutions. The Scottish Government and local councils employ them, and they work within Scotland’s charities and not-for-profit organisations. But you’ll notice I still haven’t defined exactly what a paralegal is. So what happens when you ask paralegals to define their title themselves? Surely they know what a paralegal is? “A non-solicitor fee-earner” comes close to a definition, but seems to lack aspiration. From my previous work in the NHS it is extremely hard to imagine a highly qualified and experienced nurse-manager describing themselves as a “non-doctor care-giver”. “Professional legal support staff” at least avoids a definition that rests on not being something, but then “support” doesn’t capture the workload of the hundreds of paralegals who are actually providing valuable front-line services to clients. Perhaps more concerning is the fact that anyone can currently use the title. While law firms tend to have rigorous recruitment and supervision arrangements, especially since the solicitors supervising the paralegals remain personally responsible for the quality of their work, this is not always the case with non-law firms. The Law Society of Scotland has received complaints in the past from members of the public who have thought they were getting legal advice from a qualified and knowledgeable source, only to find that anyone can use the title paralegal, that there are no set standards of practice or required qualifications, and as a group paralegals are not formally regulated. This lack of clarity is confusing for the public and those working in the sector alike. However, the Law Society of Scotland, the professional body for solicitors, is now set to establish a registration scheme for paralegals. The Society is working closely with the Scottish Paralegal Association (SPA), the independent professional association whose experienced members are calling for clear standards and more formal regulation of the sector. Work is underway that will define the learning outcomes and workplace experience someone must have before they can use the term “Law Society of Scotland Registered Paralegal”. There will be an online database allowing professionals and members of the public to quickly confirm whether someone is registered. Once registered, paralegals will be required to stay up-to-date in the law and best practice in client care. Paralegals will also be able to access Society services, including our highly respected professional practice helpline, our award-winning monthly Journal, and Update – our continuing professional development courses and online learning. There will be a clear progression path to more senior levels of registration. Rigorous standards will be set and maintained that will be transparent and flexible. We hope to work with organisations providing paralegal training to learn from their experience about what is appropriate and relevant in education and assessment. The views of the public and clients will also inform the work. The recent review of how to qualify as a solicitor provides valuable data on what non-solicitors think key skills for those working in the sector should be. And, of course, we’ll also consult with employers and paralegals themselves to make sure both education and work-based learning are at an appropriate level. The outcome of this work should lead to paralegals working to clear standards that the public can refer to, a defined career development route for paralegals, and clear grades to help recruitment, development and retention of paralegals for employers. With so much change in the profession and legal services market at the moment, I’m sometimes asked why I am regularly citing this project as one of the most exciting the Society has underway at the moment. I believe it’s because we are seeing essentially a new profession, with all that enthusiasm and experience, start to emerge and be formally recognised. And it’s because we are starting to see the “legal profession” as not just solicitors and advocates, but as a vibrant and thriving part of the Scottish economy to which a whole range of professionals contribute – something that will be a guiding theme for the Society in the future. 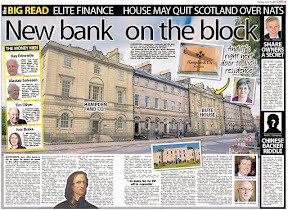 • Neil Stevenson is the head of strategic change at the Law Society of Scotland. Over the years, Scotland has seen many abuse scandals in residential homes throughout the country - many reported in the media, many more probably not. To address these issues, which have been poorly covered, dare I say, covered up by previous administrations, the Scottish Government has announced there is to be a 'truth & reconciliation' body which will be set up to "publicly acknowledge" the abuse inflicted upon thousands of children in residential homes in Scotland - reports the Scotsman newspaper. Personally, I am all for the idea of 'Truth & Reconciliation' as long as any Commission created to handle the serious issues, has the necessary power, impartiality, transparency & accountability to actually do something for the victims of, in this case, the terrible abuse against children which should never have been allowed to happen. Less of the delay, prevarication, adjusting of remits to protect the guilty or those with the most to lose - issues which we have been so used to encountering in just about every inquiry into events in the past in Scotland, instead, we should be seeing more of things like substantive action sooner rather than later, honesty, and a will to put things right by doing the right thing ... now that is what 'truth & reconciliation' is all about. There are many other areas of injustice such a proposal of 'Truth & Reconciliation' could be applied to, and I have as you know, asked the Justice Secretary Kenny MacAskill to implement such a 'Truth & Reconciliation' Commission for victims of legal abuse - which covers injustice at the hands of the legal system and legal profession itself. 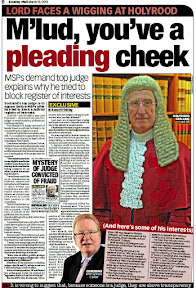 So far, Mr MacAskill has been reluctant to implement or at times, even acknowledge my request, or even that the issue exists, due it seems to too much interference from his former colleagues in the legal profession, perhaps too much favoritism towards his fellow lawyers - which has often spilled out into his debates & speeches in the Scottish Parliament itself, and of course, the worries from the likes of the legal establishment and even the judiciary that acknowledgement of the wrongs of Scots Law itself, by those who serve it or use it as a business model, against members of the public who have in many cases had their lives totally obliterated, is a step too far to take in the public interest. You can see how Kenny MacAskill and the Parliament treated my request for 'truth & reconciliation' for victims of legal abuse here : Law Society kills Petition PE1033 amid calls for review of injustice & regulatory sins of the past. 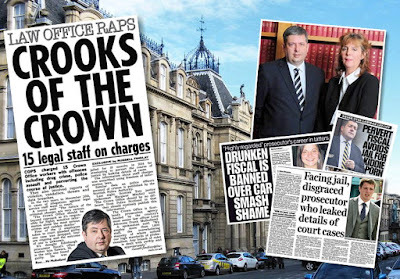 Sadly, as you can see, the Law Society once again intervened and ordered the issue closed - Parliament and the Justice Secretary complying like wee poodles to the lawyers orders ... no thought for Scots who have been thoroughly abused by by their esteemed friends in the legal system though. "Truth & Reconciliation' is a model which should be applied wisely to many areas of injustice in Scotland, and there are many areas which qualify for it's application : physical abuse, legal abuse, human rights abuse, and many more. With Adam Ingram's announcement the concept is now to be used in Scotland, there should be a wider application of this policy to clear up Scotland's injustice of the past in all areas of injustice, which would do a lot of good for the country as a whole and see a new chapter turned in the way people are treated, against the old chapter of allowing people to be mistreated. A TRUTH and reconciliation body will be set up to "publicly acknowledge" the abuse inflicted upon thousands of children in residential homes in Scotland, the Scottish Government has announced. The move could see the perpetrators of abuse being brought face to face with their victims, in many cases several decades after the offences occurred. It could also result in formal apologies from the Catholic Church, Quarriers, local authorities and other groups which ran children's homes at the centre of Scotland's abuse scandals – and promises to lift the lid on the full extent of the atrocities. However, the concept of a truth and reconciliation forum is also a tacit admission that many abusers will never be brought to justice – a fact that enrages many who still bear the psychological scars of their abuse. A consultation will be held over the detail of the project, led by Shona Robison, the public health minister, with officials set to examine the famous Truth and Reconciliation Commission in South Africa, as well as other schemes in New Zealand and Northern Ireland. Announcing the plan, Adam Ingram, the children's minister, said: "None of us should forget the physical, emotional and sexual abuse that has taken place in Scotland's residential care homes, perpetrated by the very people who should have been providing support. It would be inexcusable for us not to confront what happened. It's time for us to demonstrate our commitment through actions." Ms Robison added: "The move towards a Scottish truth and reconciliation forum will benefit victims of historical abuse by providing them with a platform to voice their experiences whilst giving public acknowledgement to what happened. "For many (abuse] survivors, an acknowledgement of the abuse they suffered would be more beneficial than monetary compensation." A spokeswoman for the Scottish Government said the scheme could lead to reports being published into the extent of abuse in children's homes, although individuals' identities would be kept secret. The administration also announced a national "hub" service to assist victims in accessing help such as psychiatric services, better training for residential child-care staff and a review of the law to address shortcomings in public records held on children in care. The move follows a review of historical abuse of children in residential care by independent expert Tom Shaw, a former chief inspector of education in Northern Ireland. 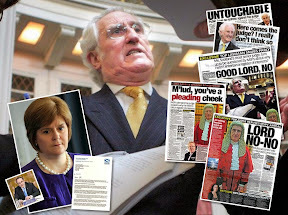 The report was triggered in 2004 when the then First Minister, Jack McConnell, publicly apologised to children who were abused while in care. But hundreds of victims from residential schools and homes such as Nazareth House, Quarriers, Kerelaw and De La Salle have been unable to come to terms with the physical, psychological and sexual abuse they suffered and are angry at the lack of public acknowledgment and concern for their suffering. With abuse dating back, in some cases, as far as the 1930s, relatively few people involved have been prosecuted, while evidence is often difficult to corroborate. Kathleen Marshall, Scotland's children's commissioner, said: "Most people desperately want to be heard. They want an apology. This could provide that opportunity." ELIZABETH McWilliam no longer wants to hide in the shadows, struggling on her own to cope with abuse she describes as "atrocities". "We've been the silent minority. Now it's time for us to be heard," says the 70-year-old, one of hundreds of children abused by staff at Quarriers homes in Scotland in a period spanning decades. She says that she "just wants the truth". But reconciliation is another thing. "I will never forgive and forget. The government must make these people face up to what they've done." But she says a truth and reconciliation forum could help Scotland to move on from the shame of its past. "This is a new dawn, a new horizon for children in care now," she says. "We've got to look forward to the future." However, Adeline Spence, 45, from Glasgow, is less convinced. Ms Spence, who was abused by nuns at Nazareth House children's home in Cardonald, said: "I don't know what difference it will make. These people need to be taken to court." THE abuse inflicted on children in residential care was described four years ago as Scotland's "national shame" by the then First Minister, Jack McConnell. Adam Ingram, the children's minister, has already announced an inquiry into allegations of – and convictions for – child abuse at Kerelaw, a residential school and secure unit in Ayrshire that sparked Scotland's biggest child abuse investigation before it closed in 2005. However, that was just the latest in a succession of abuse scandals in residential institutions for children. The list has grown in recent years. It includes: Larchgrove, a council-run children's home in Glasgow; Blairs College, a seminary in Aberdeen; St Ninian's, a school run by monks, the De La Salle Brothers, in Gartmore, Stirlingshire; and Nazareth House, a chain of Catholic children's homes. A Scottish Truth and Reconciliation Forum is to be set up to support adults who suffered childhood abuse, initially focusing on the needs of survivors of historic abuse in residential care. The move was among a package of support for adult survivors of abuse announced by Children's Minister Adam Ingram today. "None of us should forget the physical, emotional and sexual abuse that has taken place in Scotland's residential care homes - perpetrated by the very people who should have been providing support. "The system let these young people down in the most terrible way and it would be inexcusable for us not to confront what happened. "It's now time for us to demonstrate our commitment through actions and that's why we're driving forward with the measures announced today." "The move towards a Scottish truth and reconciliation forum will benefit victims of historical abuse by providing them with a platform to voice their experiences whilst also giving public acknowledgement to what happened to these children. "Through close working with survivors and the organisations that represent them, we have come to understand that for many survivors an acknowledgement of the abuse they have suffered would be more beneficial than monetary compensation. "It is on this basis we have begun to explore the use of a truth and reconciliation model. I hope that through that process there will be an opportunity to give survivors a chance to speak about their experiences but also learn lessons to ensure that children in the future are better protected." "What many survivors want is acknowledgement of what happened to them and a truth and reconciliation forum can help them to achieve that. "What we are now seeing is actions, not just words and that has to be positive." Today's announcement is the Scottish Government's response to recommendations in a review of historical abuse of children in residential care by independent expert Tom Shaw. 2. Scotland's truth and reconciliation forum will give survivors the chance to speak about their experiences, establish the facts and learn from the suffering to help protect children in the future. Ministers are supportive of proposals for a national framework of advocacy, mediation and counselling services to help in-care abuse survivors which are being considered by reference group Survivor Scotland. Subject to the group's endorsement and Ministerial approval, funding will be made available. The Scottish Government has asked the National Archives of Scotland's Keeper of the Records to carry out a review of the legislation on public records. Ministers have accepted recommendations from the Scottish Law Commission that prescribed personal injury claims (pre-September 1964) cannot be revived. Court ruling on Hep C inquiry - time for Government to admit responsibility and do the right thing for victims. For years, local Health Trusts, the NHS, civil servants, local authorities, and Government Ministers have done their utmost to prevent an inquiry into the use of contaminated blood products on the NHS which have caused suffering & death to patients who received blood transfusions of infected blood products - which someone knew about and did nothing about. Rather than admit responsibility, successive administrations have played with people's lives, destroyed medical files & records, interfered in people's access to justice with willing help from the legal profession itself, and prevaricated victims attempts to get an inquiry and answers into what happened to them at the hands of the health service - all because the same Health Trusts, NHS staff, civil servants, local authorities, and Government Ministers wont admit they were at the very least, negligent, and at the most, knew of events as they occurred and did nothing about it. 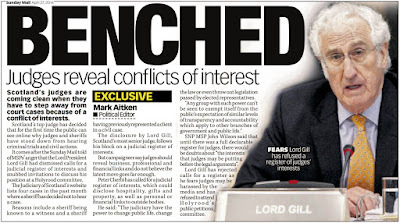 However, after long campaigns by victims families, Lord Mackay has overturned a dictatorial 2006 ruling by the Lord Advocate denying Fatal Accident Inquiries into the deaths of two victims of the contaminated blood products scandal, declaring the Lord Advocate, Elish Angiolini's ruling breached the Human Rights of the victims. However good the news is there will now be inquiries into the deaths, the fact remains that inquiries into events in Scotland have a less than honest record when it comes to getting to the facts - with remits being changed, argued over just in case some people or vested interests may be threatened with exposure .. etc .. Isn't it time for a touch of honesty now for all the victims of the contaminated blood products scandal ? A touch of honesty, in the form of an admission of guilt, negligence, and a fast track system to compensate the victims and provide the answers which people should have been given many years ago. Such a move isn't impossible, as the Japanese Government have proved, with, after long campaigns also in Japan over similar cases where people have fell ill or died through the use of contaminated blood products, the Government of Prime Minister Fukuda has decided to recognise its responsibility in the Hepatitis C transmission due to the use of the blood products, and offer apologies & compensation to those affected. So why is this not possible in Scotland ? Indeed, why is this attitude not possible in the UK ? Are we up for it in Scotland ? Does our Government have that 'touch of honesty' to go the extra mile and resolve these issues as they should be resolved ? Lawmakers in Japan have publicly recognized the government's responsibility in Hepatitis C transmission from tainted blood products. While a recently passed bill will offer compensation to those affected, it will be interesting to see if other administrations follow suit. The House of Councilors voted unanimously Friday to enact a law to give uniform relief to people who contracted hepatitis C from tainted blood products. With the passage of the hepatitis C bill, about 1,000 people, including the 207 hepatitis C plaintiffs who sued the government and drugmakers, will receive an apology and compensation from the government. In a statement issued following the law's enactment, Prime Minister Yasuo Fukuda said: "We must frankly admit the state's responsibility for causing huge harm to the victims and for failing to prevent the harm from spreading. I express my apologies from my heart." With the enactment, the plaintiffs plan to conclude a basic agreement Tuesday with the government to pave the way for the pending lawsuits nationwide to be settled out of court. Watching the Upper House approve the legislation in the chamber, plaintiffs smiled and some wiped away tears. Michiko Yamaguchi, who leads the plaintiffs' group, said, "I feel that the five years of fighting (since the lawsuit was filed in 2002) have at last paid off." Fukuda plans to meet with the plaintiffs Tuesday. Stalled negotiations on out-of-court settlements saw a breakthrough after Fukuda announced Dec. 23 his decision as president of the ruling Liberal Democratic Party to seek a lawmaker-sponsored bill to provide blanket relief to the sufferers. The bill was submitted Monday to the Diet, was passed unanimously Tuesday by the Lower House and was sent to the Upper House for final legislative approval. Under the law, people who contracted hepatitis C from contaminated blood products, including fibrinogen, will receive compensation ranging from ¥12 million to ¥40 million per person depending on the severity of the case. The government will provide around ¥20 billion to set up a fund at the Pharmaceuticals and Medical Devices Agency to pay the relief. The drugmakers will also be required to offer contributions. * The government admits responsibility for causing huge harm to victims and failing to prevent the harm from spreading. * The law will provide relief to those who contracted hepatitis C from contaminated blood products, such as fibrinogen. * Victims entitled to relief are required to submit certification as hepatitis C sufferers, such as court rulings. * Compensation ranging from ¥12 million to ¥40 million per person will be paid depending on the severity of the case and the balance will be paid if the condition worsens within 10 years. * A fund will be set up to ensure payments, with the government providing the resources. * The fund will call for drugmakers to provide contributions. Fukuda, Kawada & Yamanishi, "Landmark Hepatitis C Settlement"
FOR the last eight years of her life, Eileen O'Hara was in constant pain – all because a blood transfusion that was meant to save her life went wrong. The grandmother was one of many innocent victims fatally infected with the debilitating hepatitis C virus by contaminated NHS blood stocks during the 1970s and 1980s. 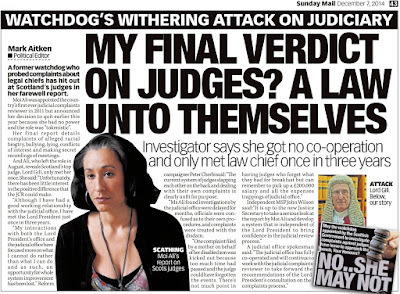 After a long campaign, her relatives yesterday celebrated a judge's landmark decision that will force Scottish ministers to launch an inquiry into the scandal. 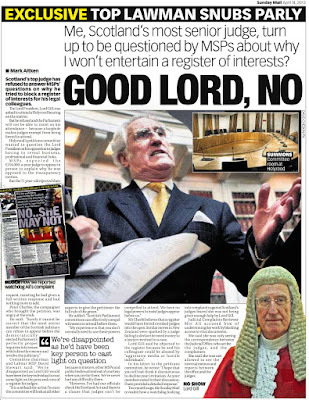 Lord Mackay overturned a 2006 ruling by Scotland's most senior law officer, the Lord Advocate, Elish Angiolini, who ruled there should not be fatal accident inquiries into the deaths of Mrs O'Hara, 72, and the Rev David Black, 66, a haemophiliac who died of hepatitis C in 2003. 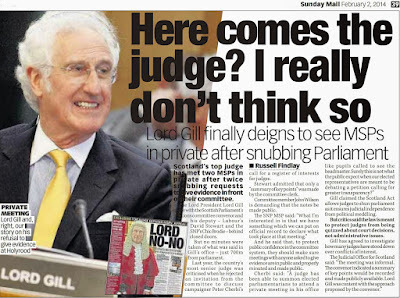 Lord Mackay held that Ms Angiolini's decision had breached their human rights. 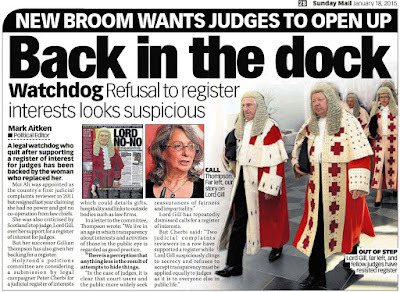 It is thought to be the first time a Scottish judge has quashed a decision of the Lord Advocate. Mrs O'Hara's daughter, Roseleen Kennedy, said: "We knew we couldn't change what had happened. It's really been for us about finding out the truth, and always realising that there's hundreds of others out there that may still have this to go through. We didn't want anyone else to be in this position." Another daughter, Annette O'Hara, 39, from Bishopbriggs, said: "I'm delighted that at last we get an opportunity to find answers to the questions we've had for many years. "It's been a struggle. It has been very difficult at times, but luckily we are a close-knit family and we've been able to support each other. It would have been easy to give in, but we just felt that we had to do it for our mother." Mrs Kennedy, 42, from Scotstoun, Glasgow, described how her mother's illness had gone undiagnosed until 1995, when she was diagnosed with cirrhosis of the liver and subsequently hepatitis C. She contracted it during one of two operations on her heart in 1986 and 1991. "It wasn't just one part that hurt – it was her whole body," she said. "Her stomach became swollen, her liver and spleen enlarged. Later on, she needed a wheelchair whenever she wanted to go out. "She had always been a very active person. In the final weeks, she was bedridden in hospital." 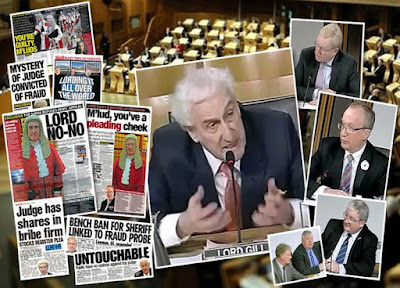 A summary of Lord Mackay's findings said any investigation "could include the Lord Advocate seeking a fatal accident inquiry before a sheriff or the setting up of a public inquiry by the Scottish ministers". The previous Labour administration at Holyrood had resisted calls from victims and their families for a public inquiry, but the SNP government has said one will be held. Its remit has yet to be established. Frank Maguire, of Thompsons Solicitors, has campaigned on the family's behalf for more than three years. He said that while the inquiry would focus on the deaths of Mr Black and Mrs O'Hara, it would have implications for other sufferers. "There are still people out there who have had transfusions in the 1980s and early 1990s who don't know they have hepatitis C because nothing has really been done about tracing them and they may have never come back into contact with hospitals since then," he said. Hepatitis C is spread mainly through contact with the blood of a person who is infected. It can lead to liver failure, but it can take years, or even decades, for symptoms to appear. BRITISH soldiers could face months of anxious waiting for tests to establish whether they were exposed to contaminated blood in Iraq and Afghanistan, it emerged yesterday. All of the 18 military casualties given transfusions with blood that had not been tested properly have now been informed of the risk. But Derek Twigg, the defence minister, said some had still not had their tests completed because blood samples could not be taken for "some months" after the transfusion. It was revealed last month that seriously injured British troops had been given blood from the US military that had not been properly screened, meaning it could contain infections. Mr Twigg added: "The MoD fully recognises the distress this will have caused." Pressure has mounted on Scottish ministers after a senior judge ruled that authorities acted unlawfully by refusing an official investigation into the deaths of two patients who died after being infected with hepatitis C through NHS blood transfusions. 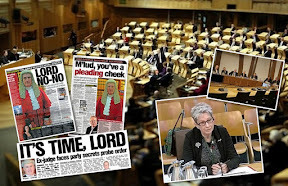 In an unprecedented move Lord Mackay of Drumadoon yesterday quashed the Lord Advocate's decision not to hold fatal accident inquiries into the deaths of Eileen O'Hara, 72, and the Rev David Black, 66, who both died in 2003. 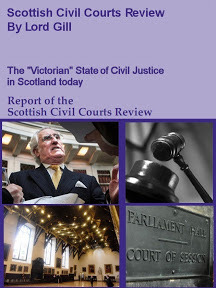 Lord Mackay's judicial review findings, issued by the Court of Session in Edinburgh, said ministers and Scotland's most senior law officer acted in a manner incompatible with their rights. Last night the SNP administration was coming under pressure to honour a pre-election pledge to hold a public inquiry into people infected with hepatitis C and HIV from blood products in the 1970s and 1980s. The former Labour-led Scottish Executive had resisted calls for a public inquiry in 2006 from victims and families of some 4000 people in Scotland who were given contaminated blood. Mrs O'Hara received blood transfusions in 1985 and 1991 and was later diagnosed with hepatitis C.
Mr Black was a haemophiliac who had a liver transplant and received blood transfusions in the 1980s. He died of liver cancer due to hepatitis C.
Yesterday's ruling was welcomed by Mrs O'Hara's family and other campaigners. The judicial review was raised by Roseleen Kennedy, one of Mrs O'Hara's daughters, and Mr Black's widow Jean. At a press conference in Glasgow, Mrs Kennedy, 42, a schoolteacher from Scotstoun, Glasgow, said: "I am just delighted that at last we got an opportunity to find answers to some of the questions that we have had for many years." Solicitor-advocate Frank Maguire who campaigned on the families' behalf for more than three years, said the £100,000 cost of the families' legal action would be paid by the Scottish Government. He said the families now wanted a full judicial inquiry by a Court of Session judge. Philip Dolan, chairman of the Scottish Forum of the Haemophilia Society, which provided almost £50,000 for the legal fight, described the ruling as "great news". In his findings, Lord Mackay said both the Lord Advocate and ministers had flouted Article 2 of the European Convention of Human Rights which states that "everyone's right to life shall be protected by law". The law says that when a person dies after hospital treatment, ministers are obliged to have in place a system capable of providing an effective investigation into the death. Lord Mackay further ruled that the only way such an investigation into the death of Mrs O'Hara or Mr Black could be achieved would be if the authorities were to initiate a public inquiry. 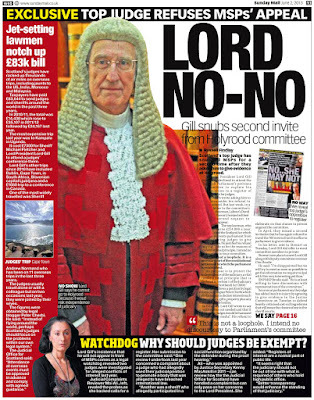 Lord Mackay continued the cases until a further hearing to allow the Lord Advocate and ministers to decide what action they will take after the ruling. No date has been set for the hearing. Health Minister Nicola Sturgeon said yesterday: "We will now study the judgment in detail and in discussion with the Lord Advocate will consider its wider implications." Dr Richard Simpson, Labour's spokesperson on public health, said: "Labour supports the right of individual families to know the exact circumstances that led to the death of their loved ones." Ross Finnie, Liberal Democrats health spokesman, urged Ms Sturgeon to offer Lord Mackay the Scottish Government's "absolute commitment" to hold an inquiry. Scottish Conservative Party justice spokesman Bill Aitken said he felt it was inappropriate to comment ahead of further legal and judicial process being completed. 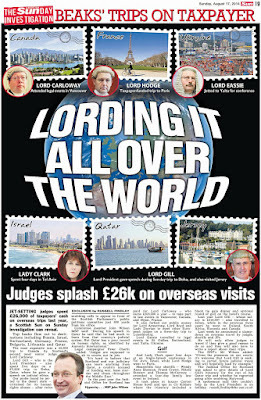 A Crown Office spokesman said the opinion of the Court of Session and Lord Mackay, in particular, had been noted and would be "carefully considered" before any decision was taken.